LPUNEST 2019 B.Tech Admissions | Notifications Out! LPU NEST that is the exam that is conducted by the Lovely Professional University for the admissions in every branch. Recently, the notification has been issued regarding the B.Tech NEST 2019. LPU NEST is also called as Lovely Professional University National Entrance and Scholarship Test which is a university level entrance exam for the students who want to take admission in the university. 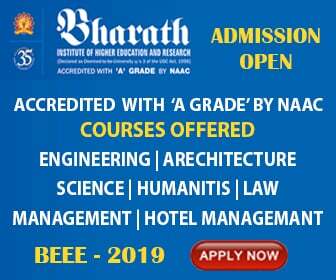 Through this candidate can get admission in the multiple fields like Engineering, Management, Law, Design, Agriculture, Hotel Management & many other courses of the University. Lovely Professional University will conduct the Schedule 1 of LPUNEST 2019 on 21st January - 05th February 2019. The Second Scheduled of LPUNEST 2019 is 05th - 30th April 2019. There are 15 B.Tech. streams in LPU. Thus, candidates qualifying LPUNEST 2019, can enroll in any one of them for the academic session 2019-20. LPUNEST is conducted in online mode only"
Qualifying Exam: Applicants appearing for LPUNEST (B.Tech.) should have either completed or shall be appearing in 2019, in final examination of 10+2 from Central Board of Secondary Education (CBSE, New Delhi) or The Council for Indian School Certificate Exam (CISCE, New Delhi) or State Board or any other Council, Institution, college etc. declared recognised by Council of Boards of School Education (COBSE), New Delhi or any other concerned apex body as applicable. For B.Tech. Biotechnology (BT), B.Tech. (Food Technology), B.Tech. (Biomedical Engineering). The test duration is of 150 minutes (2 hrs. 30 min.) and consists of 110 multiple choice questions (MCQ) of the objective type. The applicant can appear for the test in English and Hindi medium as well. When asked whether LPUNEST (B.Tech.) Kit already purchased or not, Click "Yes" if you have purchased the LPUNEST (B.Tech.) Kit. Fill the OMR sheet No. and Unique OMR code, in the given space. The application fee is Rs.500/- for boys and Rs. 250 for girls (for online). For offline, the fee is Rs.500/- for both boys and girls. Important Dates for LPUNEST 2019 B.Tech Admissions.